I am sure I’ve been told the historical and cultural stories behind the mid-autumn festival. Something about smuggling an important message to the masses inside mooncakes and something about a beautiful lady descending from/ascending to the moon? To me though, mid-autumn festival is about eating delicious mooncakes with my family & childhood memories of holding and seeing beautiful lanterns made of cellophane stretched around wire frames. I spent a part of my childhood in Malaysia, and during mid-autumn festival, Chinese children from the neighbourhood would come out after dinner and parade their lanterns at night under the glorious bright full moon. The lanterns can get quite elaborate. My favourite ones were the ones shaped like animals. This morning we made very simple lanterns. We simply decorated some glass candle cups using crepe paper streamers and mix-a-paste glue. 1. Cut streamers into various lengths. Placing the rolls of streamers in old ice-cream containers and using them as dispensers worked a treat. 2. Paste the streamers onto the glass candle cups. Old glass jars would also work. N wanted to make a Batman lantern. Unfortunately we did not have any black and grey crepe paper. After much persuasion, he reluctantly used different colours to cover his cup. M wanted to make a Superman lantern. He covered his cup entirely with red. 3. Let the glass candle cups dry. 4. Place candles in the cups. 5. Light the candles and enjoy! 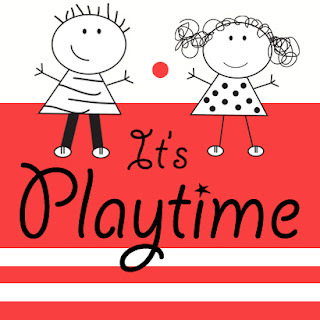 This post is part of the “It’s Playtime” link up.